Chief Minister Naveen Patnaik has urged the Centre to establish a defence industrial corridor, along with an aeronautical university, in Odisha. The Odisha government is in talks with some leading conglomerates such as Mahindra, Adani and Hinduja to explore possibilities of local defence manufacturing. The state government has plans to develop a defence manufacturing cluster and is giving final touches to an exclusive defence manufacturing policy. “Some of the companies that we have initiated talks with are keen to put up their defence manufacturing units. They have submitted a wish list and are awaiting the finalisation of our policy on defence manufacturing. Once we are done with the policy, we hope to attract some concrete proposals,” said an official source. The state government sees immense value in defence manufacturing. Home to Chandipur, one of the busiest missile testing facilities, the state has in place an ecosystem to facilitate the growth of aerospace and defence sectors. 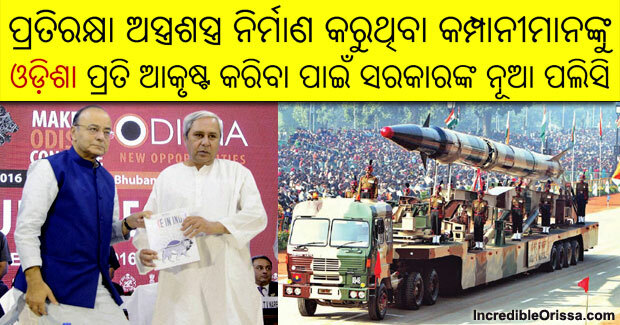 Odisha also has a premier test laboratory set up by the Defence Research and Development Organisation (DRDO). Aside from the DRDO laboratory, there is an ordnance factory at Bolangir and Hindustan Aeronautics Ltd’s aero engine facility at Koraput. The essential raw materials for manufacturing aerospace and defence components are iron, steel, ferro-alloys and aluminium, which are produced in significant quantities in the state. The state has attracted one investment in the defence sector from Mumbai-based Sure Safety Solutions Ltd. Anchored by Tata Steel, the unit for manufacturing aerial targets has come up on five acres of land at the industrial park at Gopalpur in south Odisha. The unit has been set up in technical collaboration with UK-based Meggit Defence at a cost of Rs 500 million.